It’s not everyday that we get the chance to share our customer’s journey from dreams and concepts to a space they use every day with their family and friends. After one of our recent remodels, we had a chance to do just that. After finishing a project, we asked the folks who had us create the space to answer a few questions. We want to share those answers with you and talk a little about the wonderful stories that go into this most beloved of spaces–the kitchen. What were your biggest goals for your new space or reasons you wanted to remodel? I would have to say our biggest reason for the remodel was to add additional counter space, storage and open up the space between the kitchen and the dining room. We wanted a space where I could cook with my children and give them a space where they could be coloring or playing at the counter while I cooked. We eat in our dining room everyday, but felt that it was closed off from the rest of the space before the renovation. 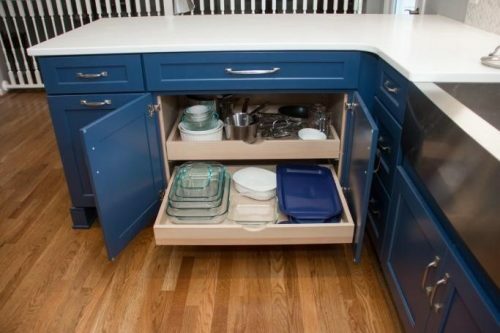 Designer’s Notes: We hear folks wanting more counter space and storage a lot. It’s great to be able to provide ample counter space for activities in this kitchen with the large quartz counters. Beautiful cabinets from Medallion Cabinetry provides great storage options as well. What inspired or led you to the selections in the space? We had been discussing remodeling the kitchen since before the home was officially ours. I would walk through the local home improvement stores on a regular basis and flip through their options. As I was flipping through, I couldn’t seem to draw my eyes away from the color blue. It wasn’t the traditional white or natural wood, but I couldn’t stop thinking about it. 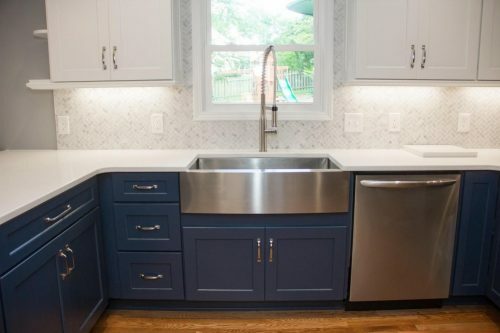 I knew I didn’t want the whole kitchen blue, but I really wanted it somewhere. I looked online at tons of websites to see what I liked. 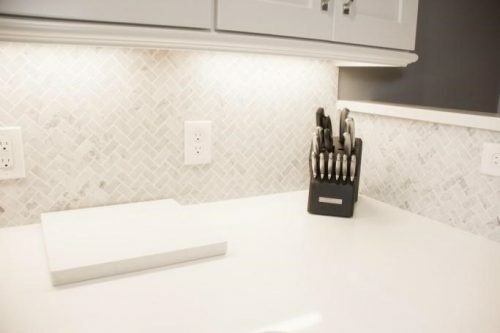 I joined house remodel apps to see what other people had done and quickly learned that I loved herringbone marble and quartz counters. I knew the details that I wanted, but I didn’t know how to put it all together and lay it out. Sara was able to take my hazy vision and turn it into reality. Designer’s Notes: Blues are HUGE and not going anywhere. 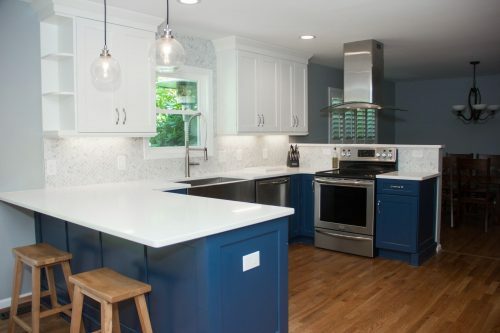 We love the custom blue paint color this family chose. It makes a great statement without being too overwhelming. What are your favorite items or features in the space? I think we all agree that the incredibly large peninsula is our favorite. I love that my children have somewhere to eat, color, play and cook with me. It is fun to stand around the peninsula, have a snack and talk together. Designer’s Notes: When it’s possible, we love to incorporate seating into a kitchen because this is where everyone naturally gathers. With children in the home, countertop-height seating is much safer and more usable than raised bars. This also provides one large area for activities because of the added depth. On top of that, clients with children can be at ease when using quartz because it does not stain and is easy to clean and maintain. How has the remodel impacted your daily life? I think the biggest impact the kitchen remodel has made to daily life is the ability to all be in the kitchen together and work together to make a meal or cookies. Before, we had limited counter space and it was difficult to make larger meals. Baking cookies together was impossible to do in the original kitchen, and we were always forced to go into the closed-off dining room. Now we have a large space to mix, roll, bake and eat our holiday cookies! Designer’s Notes: Hearing these successes is why we love to do remodels. A kitchen is not just a space to cook, it’s the heart of a home and a space you use everyday. Working in ways that make for good memories and easier experiences is so heartwarming! How would you describe the space or what feelings does it evoke? The space always makes me smile. This was something I dreamt about, and to see it become a reality is still very surreal. I probably still say “I love this kitchen!” on a weekly basis. Designer’s Notes: We love that! Designing a “Dream Kitchen” is something you hear about all the time, but when you see it come alive for a family that you worked with, it makes everything so fulfilling. Any tips or tricks you’d like to share to those looking to remodel? The crockpot and crock pot liners (less to clean up) are wonderful as are microwaves and toaster ovens. This allowed us to still have home cooked meals most of the time throughout the renovation. Designer’s Notes: That’s a great tip! We do everything we can to make a remodel easier on our clients. It’s can be a stressful time, but in the end, we think it’s worth it. 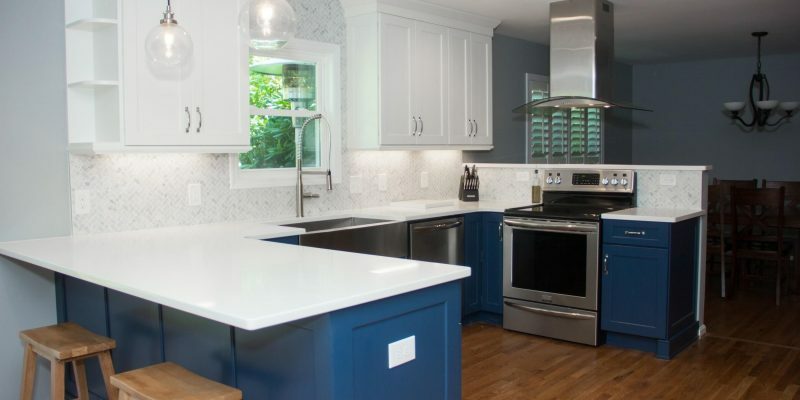 We hope you enjoyed this great interview with an amazing client about their wonderful kitchen remodel experience! Building and remodeling homes that allow people to love their space for years is what we love to do.